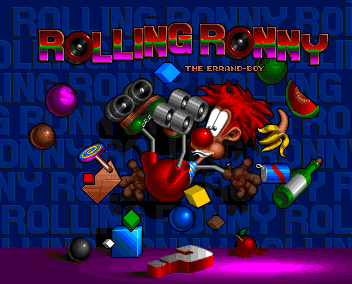 This week on Super Adventures I'm playing an Amiga game about a clown on roller skates! Why? Because the title Rolling Ronny popped into my head the other day for no reason and decided it was going to sit in my brain for a while. So I went looking through my memory for clues to why I remembered this name all of a sudden and realised that I have no idea what the game is. I'm sure I must have played it back in the day but what I saw on my flicking CRT TV screen was apparently so horrifying that my mind blanked it out to protect my sanity. Either that or it's just not very memorable. So now I'm playing it again so that I'll know one way or the other, for my records. I'll give it an hour or two, take some screenshots and write what's going on underneath them as I go. Because that's what my site's about. This week on Super Adventures I'm playing LucasArts' legendary point-and-click adventure game Monkey Island 2: LeChuck's Revenge! 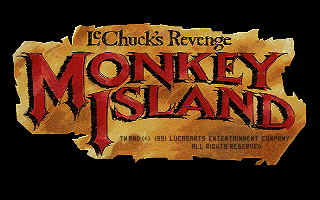 Or LeChuck's Revenge: Monkey Island according to that logo up there. Either way around it's still going to screw up your meticulously organised alphabetically ordered game library. Monkey Island 2 is a game that needs no introduction and to be honest it doesn't need any commentary or reviews either. The game's so famous and has been so thoroughly examined that anything I write about it here will be entirely redundant; I might as well just show off some screenshots and call it a day. But I just managed to find a few thousand words to type about bloody Star Wars the other day for my sci-fi site so now I feel like I can take on anything Lucasfilm can throw at me! Though the game development group had firmly switched over to the name 'LucasArts' by this point, making this the first in the series to have the iconic Golden Guy logo (there's no skit though). I dug out my old Monkey Island Madness compilation CD for this and I'll be playing the game using ScummVM, because it's awesome. The disc also has a version of Monkey Island 1 on it that's been updated with CD quality music, but Monkey 2 only has the original MIDI soundtrack. Which is good, because it'd only screw up the dynamic iMUSE effect. Who'd even want to explore a pirate town without the music seamlessly shifting to give each area its own theme? Alright, this is an adventure game, so by writing about the first hour or so of gameplay I'm going to inevitably end up giving SPOILERS for the early puzzles. I won't be ruining that ending for anyone who hasn't beaten it yet though... unless you've read my Curse of Monkey Island post, then I already have. Sorry.